Home » Basketball » State of the Knicks- Yikess!!! State of the Knicks- Yikess!!! The New York Knicks went into last week IN the playoffs if it ended at that day, but they are OUT now because of their poor play. They have had a TOUGH time winning ROAD games and that trend continued this week and now the MAJORITY of their games for the next month are on the ROAD, so their season might be going down the DRAIN, if they do NOT right the ship. The Knicks started last week with a HOME game against the Boston Celtics, who LEAD the Eastern Conference right now. The Knicks JUMPED out to a BIG lead in the first quarter and HELD on to WIN. 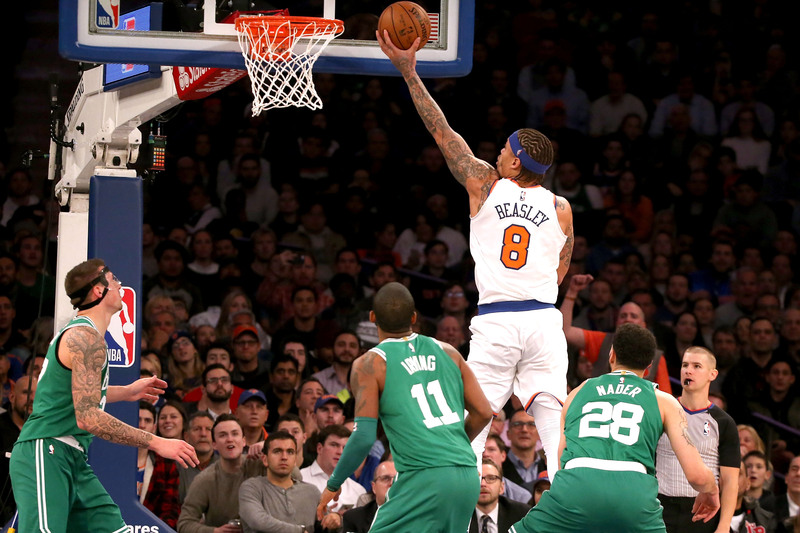 The Knicks were led by Michael Beasley who has been playing GREAT over the past few weeks in the ABSENCE of Kristaps Porzingis and Tim Hardaway Jr.
Porzingis only had ONE point in the game against the Celtics, but the Knicks still somehow managed to WIN, which showed that they contend with the ELITE teams in the Eastern Conference. The Knicks continue to show that they are a GREAT team at Madison Square Garden, but continue to STRUGGLE away from the Garden. Their ROAD struggles continued on Friday night when they LOST the Pistons in Detroit. The Knicks had the LEAD late in the FOURTH quarter but the Pistons ended the game on a 7-0 run and WON the game by THREE points. Porzingis scored TWENTY NINE points in that game, but it was NOT ENOUGH for the Knicks to get the WIN. The Knicks ended the week on Christmas Day with a matinee game against the Philadelphia 76ers at HOME. The game was back and forth for the WHOLE game and the Knicks were led by Enes Kanter. The Knicks defense could not stop the 76ers, who WON the game, despite THIRTY ONE points from Kanter. The Knicks lost TWO games last week and Beasley had a combined SIXTEEN points in those games, so the Knicks need him to contribute MORE on offense to WIN some games this week. Beasley was NOT supposed to be a viable for the Knicks, but he has been playing WELL lately and the expectations have been RAISED. The Knicks play FOUR games this week, but THREE of them are on the ROAD. Their ROAD TRIP starts tonight against the Bulls in Chicago, they go to San Antonio to play the Spurs tomorrow night, and CLOSE out the road trip against the Pelicans in New Orleans on Saturday Night. The Knicks LONE HOME game is against the aforementioned Spurs on Tuesday Night. The Bulls and the Pelicans are NOT good, and the Knicks will be the FAVORITES in those games. IF the Knicks want to make the playoffs, they NEED to WIN both of those games. The Spurs were NOT healthy to start the season, but are getting HEALTHIER, so the Knicks should try and steal a game from them this week. The Knicks are just HALF a game OUT of the EIGHT seed and TWO games out of the FOUR seed in the East, they need to beat up on teams like the Bulls and the Pelicans to get some ROAD wins under their belt. The Knicks are going on a LONG West Coast trip in the MIDDLE of January, so they NEED to learn how to WIN games on the ROAD or their season will be OVER soon. The coaching staff and the veterans on the team have to put in MORE effort to make sure that the YOUNG players on the roster can get the job done on the ROAD or this season will turn into a DISAPPOINTMENT for the Knicks. This week is very IMPORTANT for the Knicks and their future for the rest of the season, if they STRUGGLE this week, then the season is basically OVER. IF the Knicks play WELL this week, that does not make them a playoff team, they still NEED to keep their foot ON the pedal for the rest of the season and HOPE that they make the playoffs.